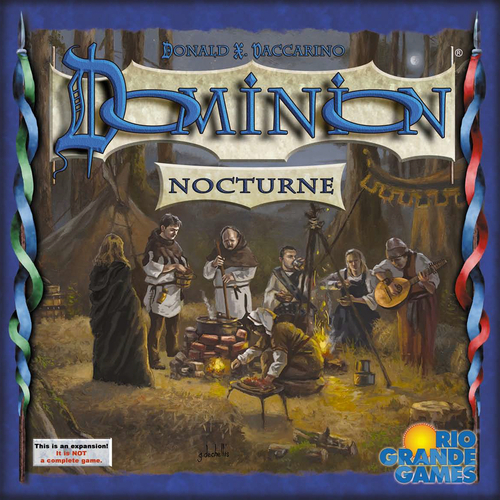 Dominion: Nocturne is the newest expansion to the world of Dominion – the eleventh expansion thus far. I am a huge fan of Dominion, and before I write any more about the game, I should disclose that I am the developer of the base game, and I’ve probably played over 3,000 games of Dominion as a result of that work. That being said, I am no longer working on Dominion (and have not since Prosperity). In fact, I didn’t even know about this expansion until I saw it advertised for sale on the Internet. Dominion has been around for almost ten years now, and Dominion: Nocturne is an expansion to that game. 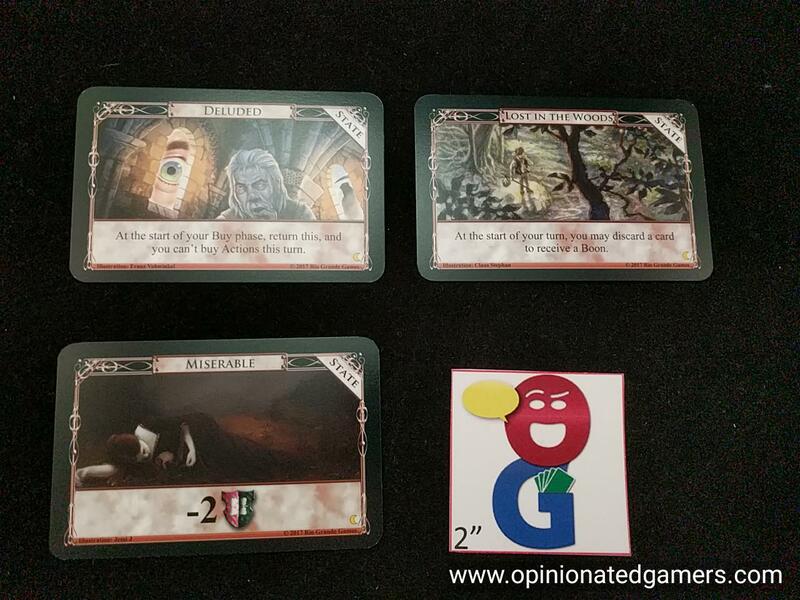 You must have the base game in order to play Dominion: Nocturne. If you are unfamiliar with the base game, I’d probably recommend not reading further here, and instead acquainting yourself with the base game. OK, so the rest of this description will assume that you are familiar with the basic mechanics of Dominion. This expansion provides you with 500 new cards – there are 33 different Kingdom cards included in the expansion as well as Randomizers and a whole bunch of supporting cards – each of which are used with particular different Kingdom cards. Like previous expansions, these cards can be used in a mix-or-match fashion with any other Dominion Kingdom cards that you happen to have. 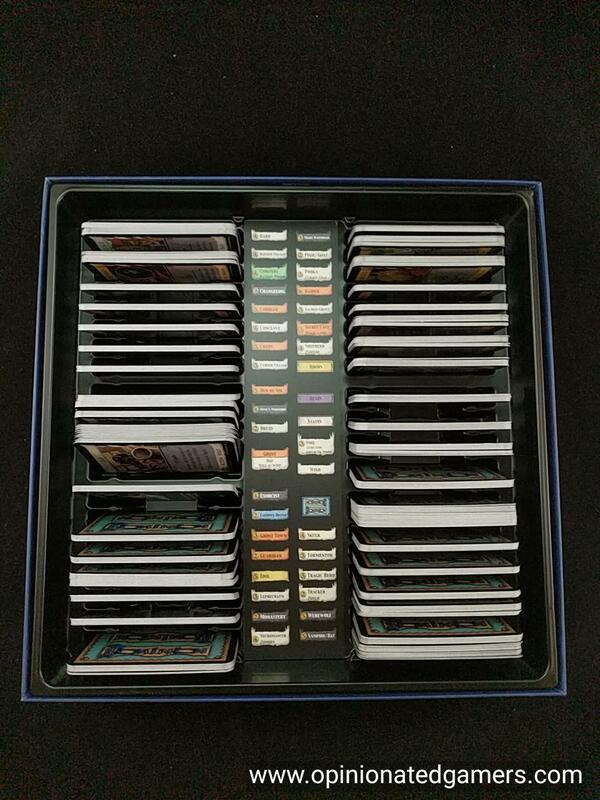 Look how full the plastic insert is! There are some Heirloom cards included – six each of seven different types. They are used in Setup. 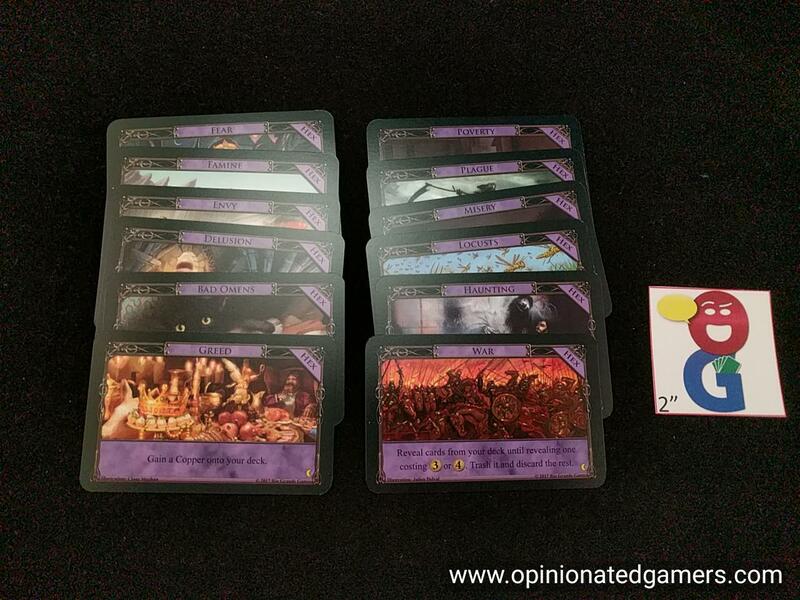 When you choose a Kingdom card with a yellow banner – which indicates an Heirloom card – each player gets one associated Heirloom card in their starting deck in place of a copper. If you have multiple Heirloom cards in your starting setup, you will have multiple Heirlooms instead of Coppers. 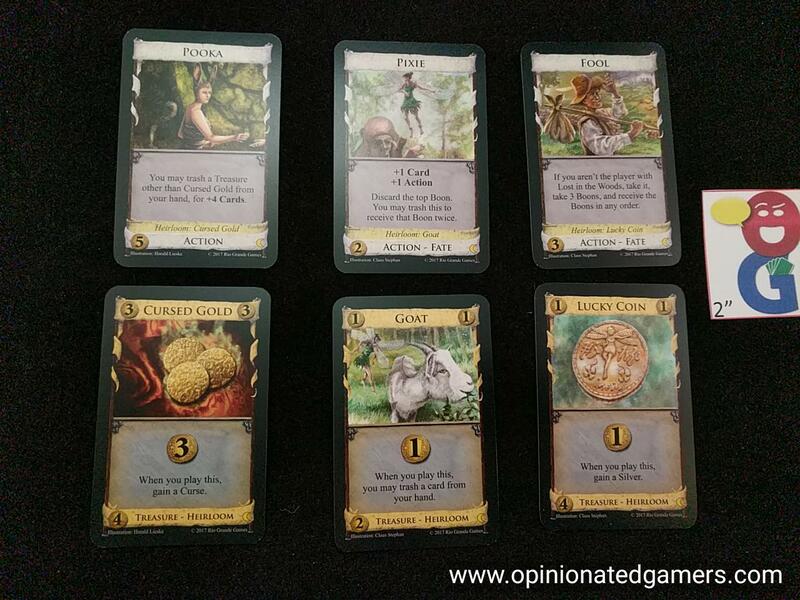 Boon cards are used with Fate Kingdom cards – there are 12 different individual boons. The 12 Hex cards are used with Doom Kingdom cards. The big addition here in Dominion: Nocturne is a new phase. What? Yes… no longer is it A-B-C. Now, it’s A-B-N-C. There is now a Night phase which comes in right after the Buy phase. In this phase, you can play Night cards. You can play as many night cards as you like in this phase as long as they are in your hand. The night cards all have a black background with white text on them. (They also helpfully say Night at the bottom). That’s about all the rule changes – once you get the hang of it, there are 33 new Kingdom cards to explore in the world of Dominion! As I said earlier, I love this game, and though I haven’t played it much in a few years, receiving this set for review was a breath of fresh air. For once, I got a chance to experience a Dominion set like everyone else. I hadn’t worked on any of the cards or even knew any of the concepts in advance. So the only way to explore the cards was to sit down and play with them! Playing with these cards, both by themselves and along with some of the older cards, has rekindled my interest in the game. As with many of the other expansions, getting a few new Kingdom cards really rejuvenates the experience. You first can work out the different interactions with the 33 new types of cards – but then, moving beyond that, you get to discover how they interact with all the other cards you have. This is not a set for Dominion novices. 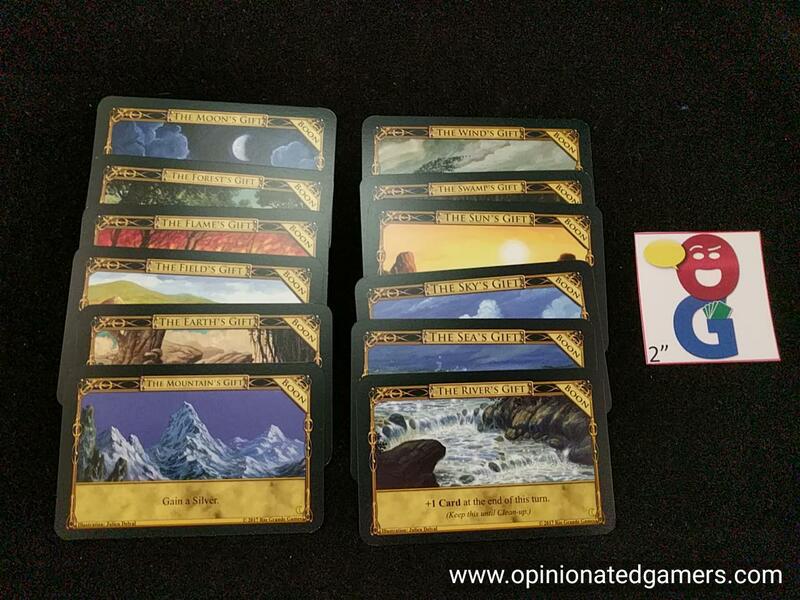 First, the setup can be a bit finicky with specific cards needed to be added in for particular Kingdom cards. 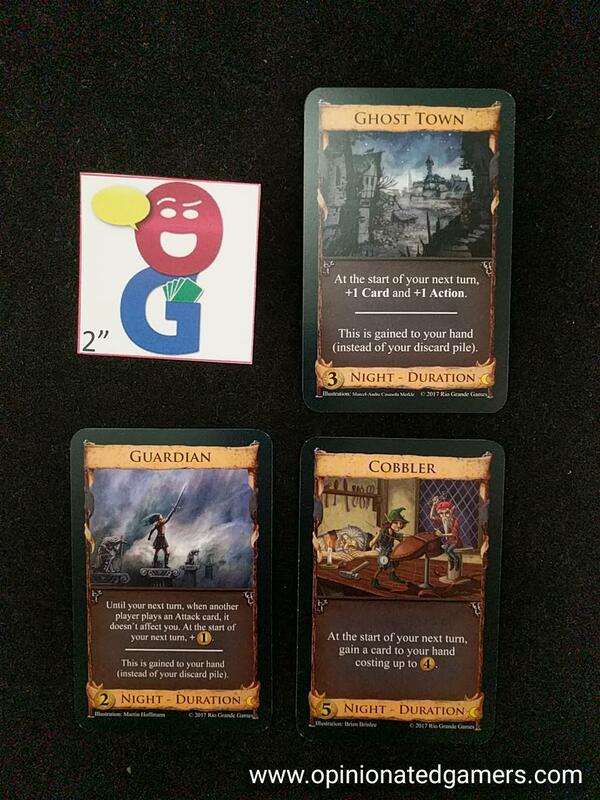 Further, the Fate and Boon cards have their own set of rules as to how they are distributed, used and discarded. The State cards are another added level of complexity. This expansion also reintroduces the idea of Duration cards – these cards add another level of strategy as they last in your area for more than a single turn; but there is also a bit of upkeep that is required to play and discard them correctly; and this is something that I would maybe not recommend to gamers who have never played Dominion before. The added complexity is also a necessary design element for a game with so many expansions… There are only so many Kingdom cards that can be designed without needing some extra rules or phases to allow for creation of new cards. At this point, I would think almost every further expansion will need an alteration to the rules to allow for the new cards. This is the same sort of progression that I saw with the rules to Magic: The Gathering back when I was young… I remember initially rebelling at the concept of Phasing, but then realized that it was a necessary construct to allow for all those new card ideas.